The Forestry Middle School located in the Community of Valle Verde just west of the Town of Zitácuaro currently participates in the Monarch Sister Schools Program through a series of actions to protect and conserve the habitat of the Monarch Butterfly. 1) A milkweed garden, with the support of Prof. Julieta Arrendondo Flores and Program Coordinator Jesús Arriaga, in addition to a group of 40 students (ages 12 and 13) from the 1st Forestry Section of the school, who plant, water, prune and, in general, maintain the garden in good shape. The milkweed garden is 20 meters long and 3 meters wide, with a total of 30 milkweed plants, 10 colorful nectar-producing plants and 6 medicinal plants that help keep the garden disease-free. 2) A student-operated Tree Nursery. Another teacher, Prof. Enrique, is responsible for Forestry Technology subject matter and receives support from Program Coordinator Jesús Arriaga in overseeing tree sapling production chain from seed germination and repotting of seedlings to planting of the baby trees, with the help of 3 groups of forestry students who are responsible for taking care of the tree nursery operation at the school. 3) Environmental Education Workshops. The teachers also allow Program Coordinator Jesús Arriaga Vázquez to conduct environmental education workshop in their classrooms, which incorporate art-based activities including drawing and painting to heighten their perception and appreciation of nature and also theater to dramatize environmental issues. 4) Conservation Activities. 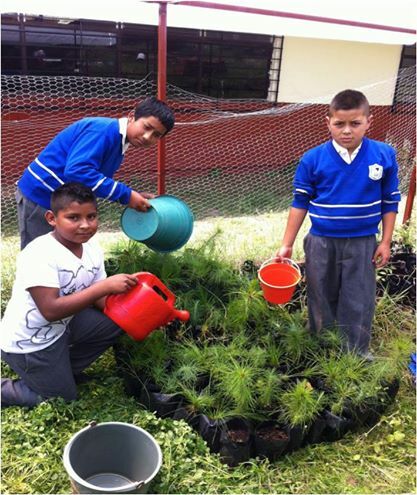 The Forestry Middle School does an annual reforestation project involving students, their parents and other local community members to reforest a key area within the Monarch Butterfly Biosphere Reserve on the comunal lands of the San Francisco Curungueo indigenous community in the “municipio” (county) of Zitácuaro in the State of Michoacán. In June 2016, 80 students and 4 teachers planted 500 trees on the mountainside of the community of Tenencia de Cresencio Morales, with the support of technical support and oversight of personal from our partner organization, ALTERNARE. 5) Cultural Activities. In early March of each year, the school normally participates in a major cultural highlight, the National Monarch Butterfly Festival organized by our Program Coordinator Jesús Arriaga, which includes music and dance performances, as well as a large community parade with local students, dance groups, civic leaders, etc.